Neil, Linda,John, Brian, Tigsiti Tekleab, Mekdes Zewde, Saron Alehayeku. 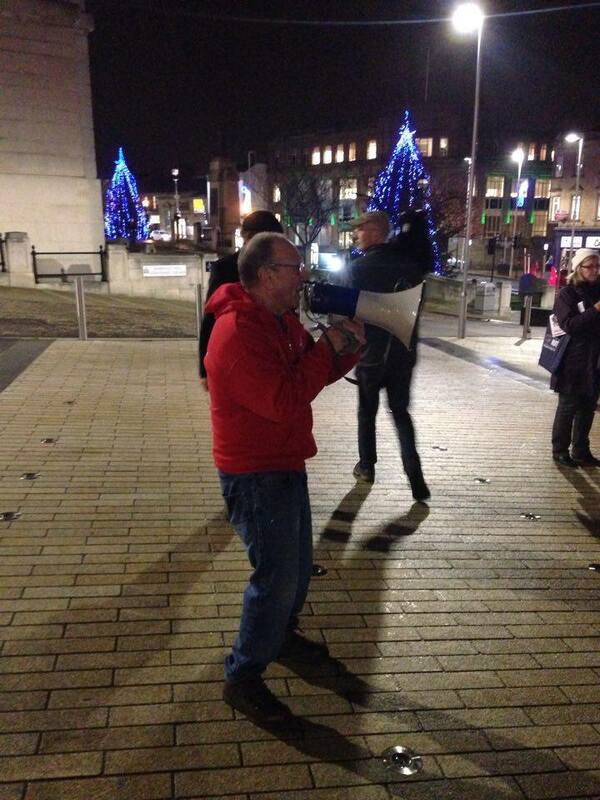 Barnsley Trades Council has launched a Christmas financial appeal in support of refugees. Trade unionists, like millions of other British people, have been shocked and angered by the horrific scenes on our TV screens from Calais, Central Europe and the Greek islands. The sight of dead children being lifted from the sea will not easily be forgotten. We have been angered too at how the Fortress Europe racist mentality shown by most European politicians, including David Cameron and his Tory Government, has only made the situation worse and led directly to refugee deaths. We have taken inspiration from the positive way that the public has responded to this human man-made catastrophe. It is estimated that 31% of the population have done something to support refugees; 100,000 marched in London in September (with 100 in Barnsley on the same day) and communities all over the country have taken food and clothes to Calais or further afield like Lesbos. Stand Up To Racism has organised several national convoys to Calais. Half of what we raise in our Appeal will go their national Christmas Appeal. 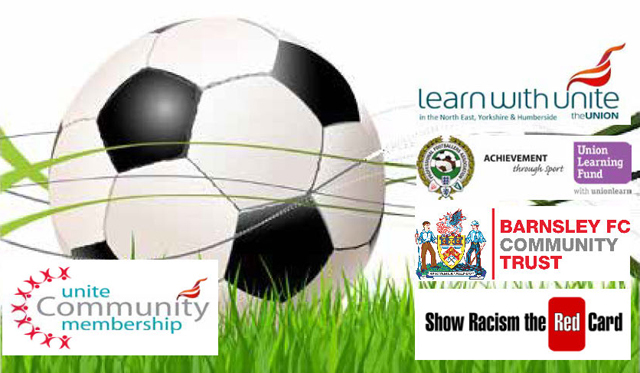 UNITE Community, from their centre in the Barnsley NUM Offices, have organised vital ESOL classes for refugees and are planning a 5 a side tournament at Oakwell in January 2016. The other half we raise will go to support their important work. Please support our Financial Appeal for Refugee Support. Send cheques to our treasurer, Dave Gibson (address above) made payable to Barnsley Trades Council. We would like to receive them by Wed. 16th December at the latest so we can distribute the money raised before Christmas. We will publish accounts and send a report to the Barnsley Chronicle. (If you have money to send after the 16th please still send it as funds will be needed after Christmas too). 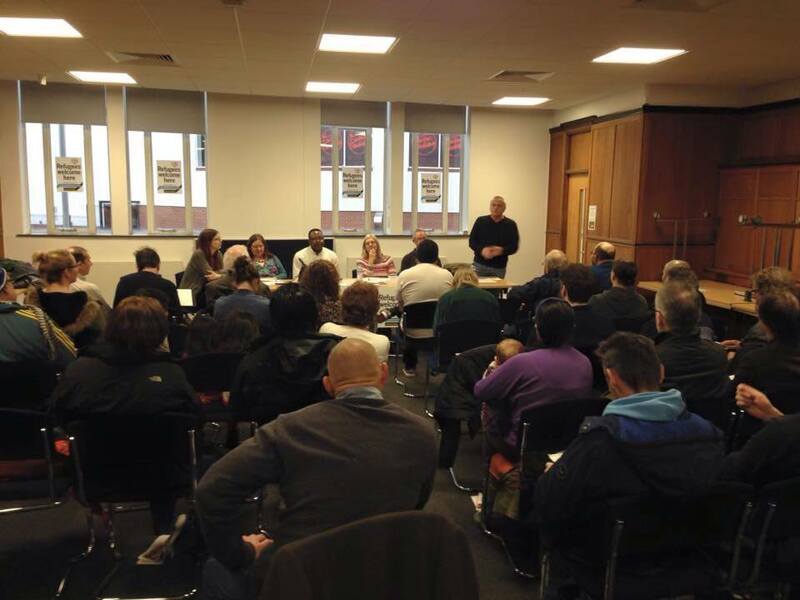 Thanks to those of you who came to yesterday’s public meeting “Refugees Are Welcome Here”. We had a brilliant meeting attended by around 40 people. Speakers included from refugee and asylum seeker support groups, a journalist from Eritrea, someone who visited the Calais refugee camp only 2 weeks ago and gave a moving descriptions of conditions there, and a local journalist. Over £100 was donated to the Trades Council appeal to support the Calais refugees and Unite’s local work with asylum seekers and refugees in Barnsley. Things are looking very positive for next Saturday’s rally in opposition to the South Yorkshire Casuals anti-immigration march (11am May Day Green). I hope you are able to get along. I have attached the leaflet for the rally – feel free to publish this around your own networks and contacts. We hope as many people as possible will be prepared to say a few words at the rally so that our message that the racists of the SYC do not represent the people of Barnsley comes across loud and clear. 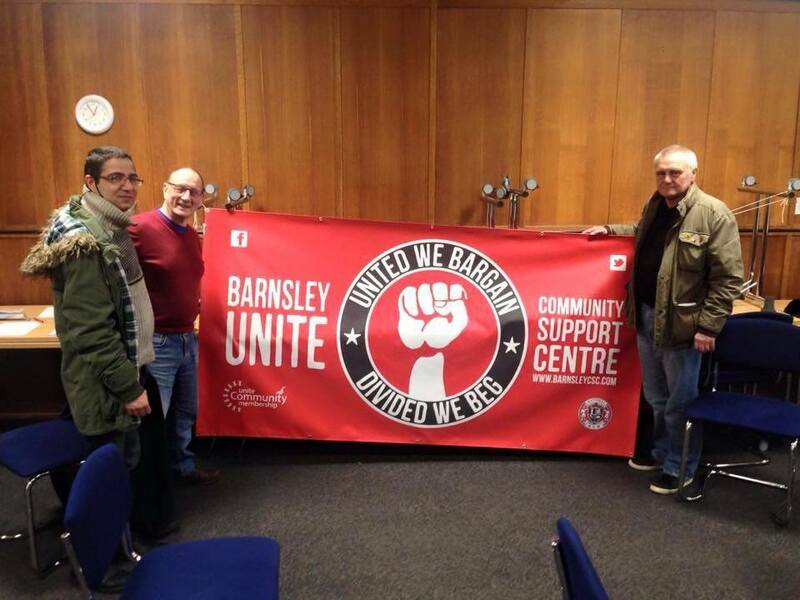 Unite Community activists John Dunn and Stuart Crosthwaite we among the speakers today at the Barnsley Anti-racist meeting. 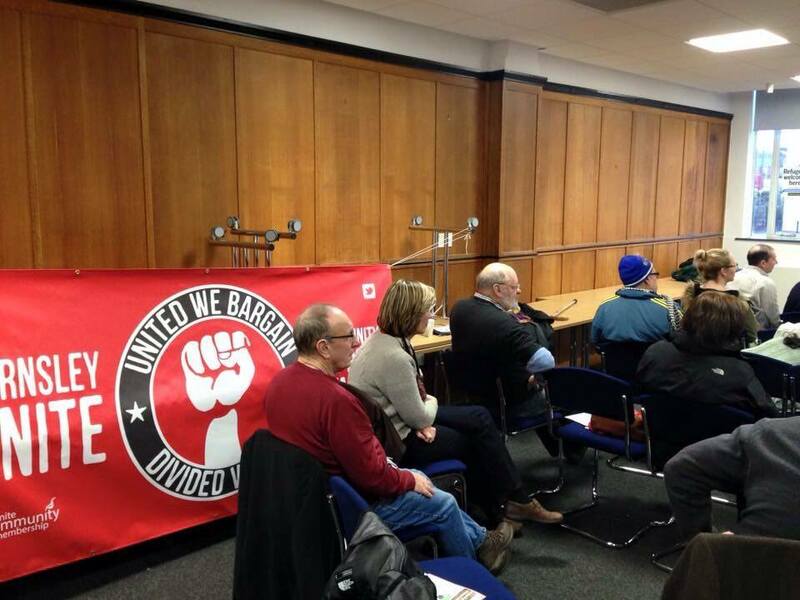 The meeting was organised to galvanise support for next Saturday’s Anti-fascist protest in the town. Our new banner was on display too, the first of many outings no doubt! Thanks again to the organisers of the meeting. 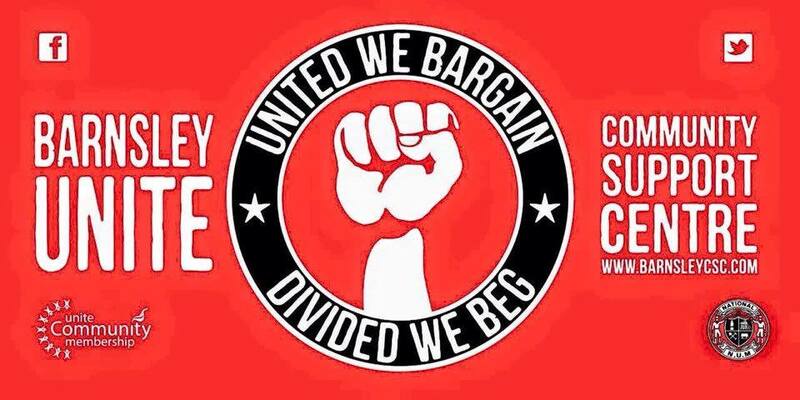 United we are strong! The group’s Facebook page can be found here. Dan, you have set out your stall to the killing of more innocent civilians and for me and my wife Janet, you will always be remembered for this and not for the many good things that you have done since you were elected as a Barnsley MP. You, as a soldier should know that despite all the fairy stories about ‘smart’ bombs, innocent people will be killed in Syria because of your decision. That is the way of bombing from aircraft as demonstrated in every war since the beginning of airstrikes. Nothing has changed. This is sad and unfortunate as far as we are concerned as we admire the progress made in Barnsley from your efforts as our MP, but we have our principles especially when it comes to war and the killing of innocent victims caught up in war. We are satisfied however, that we can hold our heads up high say to our grandchildren that the decision to go to War and join in the bombing is NOT IN OUR NAME and that you do NOT speak for us no matter what your record in other activities says about you. Some of the fathers, mothers and children of these innocent victims that you have given the green light for British aircraft to pour bombs upon have managed to risk their lives in escaping to the UK with a few from Syria ending up in Barnsley as asylum seekers. Like you, I have had the honour and privilege of listening to their stories of the horror of terrorism, civil war and the bombing from above including the forces of the West. They, like the bombs that destroy their lives do not differentiate between friend and foe – all they see and feel is suffering and pain as well as a future of no hope. By voting for a continuation of the bombing you are making their misery continue without apparent end. 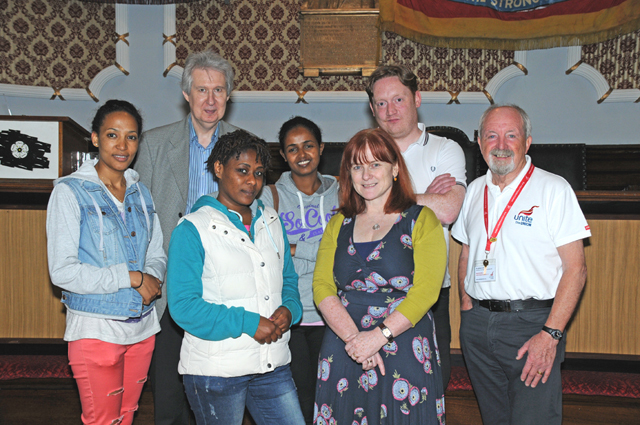 I feel proud that me and my colleagues have been able to help our Red Cross migrants in their hour of need and I feel proud that Barnsley has welcomed them in the usual fine tradition of an ex-mining town with all the principles that entails. Today they told me that the bombing by the UK would not solve anything but endanger the people of Syria who have had enough of both the regime and the forces of opposition including the terrorists. They also state that more bombs would only create more migrants. I have no reason to doubt them. I can tell you that I have apologised to them today for the actions of their own Labour Party MP’s across the UK including Barnsley and that these MP’s have sought to undermine the majority of their members and their leader. A leader elected by a huge majority on the principles he put forward. As well as this Janet and I cannot help but think that there could be an element of plotting against Jeremy Corbyn, the first genuine and principled socialist that we have had for many years and whose honest no nonsense views have resulted in a huge rebirth and restoration of the Labour Party that was withering on the vine before the leadership contest. It is with huge sorrow and not a little anger that we followed your seemingly plausible and reasoned argument for bombing. I have to say that although you support a peaceful and negotiated settlement through the UN, the fact that you have chosen to use bombs as a supplement to this process does not excuse your decision in the slightest. Killing is killing Dan despite your ‘honourable’ and studied motives as they could be described in choosing violence as a one means to solving the violence of ISIS as if violence was normal in a package of solutions to a complicated problem. In our opinion that is the most ignorant and stupid way to solve any argument and is an admission of failure by our elected representatives in an area that we have been involved for many years usually ending in force through arms to bring ‘foreigners to heel’. History has proven, however, the massive mistake of going to war in Iraq, Afghanistan and the pouring of tons of bombs on Libya, hailed a huge success by the Tories but now seen as another failure by British politicians as that country plunges into even more violence. You have chosen to be part of that continuing failure because you have not learned the lessons of history as if this is a ‘special case’ and history starts with bombing Syria! What arrogance this appears! Britain is no longer the power it was in the pre colonial days even although Cameron may desire to elevate Britain to a position that is of little interest to working people striving to survive in the age of austerity. I fear, with great sorrow, that once again we will have to go through the experience of taking another wrong turn before we once again realise the error of our ways. We should not have fallen into the Tory and Cameron trap of raising our profile among the great powers through the bombing of Syria. Karl Marx said that history repeats itself – “the first as tragedy, then as farce” That quote is most appropriate in this case, in our opinion. There is also another very practical reason why you should not have voted for war, Dan you have recently visited Scotland and you are aware of the huge gap between Labour and the SNP. Recent polls show 70% of Scots do not support the bombing of Syria. Our one Scottish MP gallantly voted in favour of the will of the Scots as did the SNP. The fact that many English Labour MP’s voted for the bombing and completely ignored the will of Scottish people is a huge body blow to the efforts of our activists in Scotland in trying to close the huge gap between us and the SNP. The SNP must be rubbing their hands in glee at another huge mistake by Labour and they could increase the gap once again because of the rank stupidity of those who voted for war. Finally (from Richard) despite the adulation of the press, the Tories and the Blairite right wing of the Labour Party over Hilary Benn’s speech (reminding me of Tony Blair before Iraq) this decision to increase the bloodshed in Syria is an own goal of enormous proportion by the Tories ably supported by you and your colleagues and will cost us dearly in the future. I do not relish this fact and I despair at our lack of intelligence and principle in this matter. I am afraid to say that as it stands at present, and with the enormous seriousness of the issue, I can no longer shake your hand or support you as our MP in Central ward Dan knowing that you have blood on your hands. Incidentally that goes for our other Barnsley MP’s (thank goodness for the sanity and principles of John Healey MP, a man of honour ). As a Unite activist, a long standing socialist within the Labour Party and an adviser and friend to our migrant members I would be rightly classed as a hypocrite (if I did shake your hand). 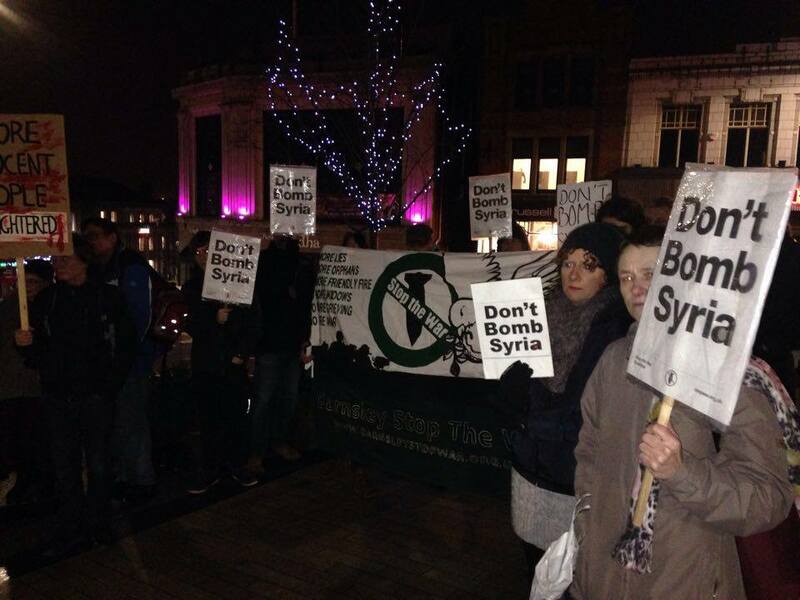 A very last minute protest against the war in Syria in Barnsley tonight saw about fifty activists and Trade Unionists gather outside the Town Hall, to make there feelings known. Not in our name! How come we have got millions for a pointless destructive war effort but no money for housing, the NHS or to defeat poverty? Weds 2 December: MPs vote on launching air strikes in Syria. Stop the War has called for vigils against war to take place across the country. Barnsley Stop the War will be holding a vigil outside Barnsley Town Hall from 5.00pm till around 5.45pm. 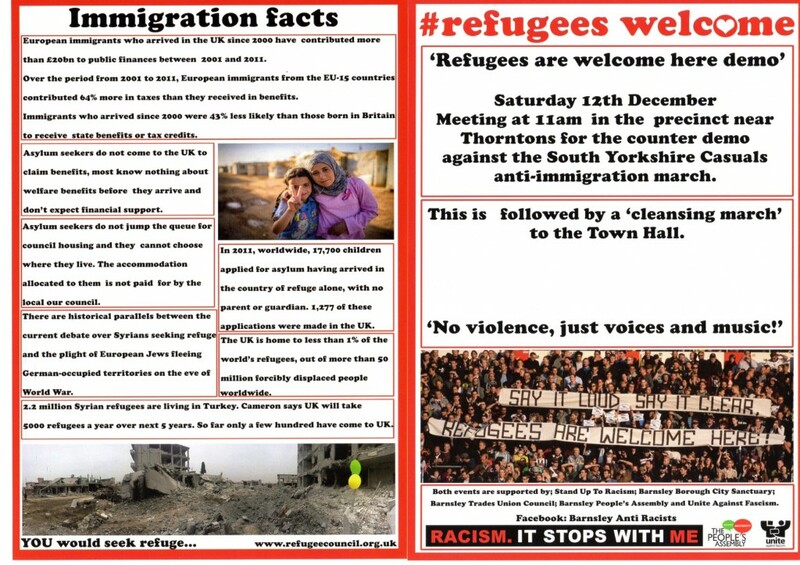 Sat 5 December: public meeting to support refugees is taking place from 11.00am in Barnsley Library. Confirmed speakers include local asylum seekers, and people who visited the Calais refugee camp only a few days ago. The meeting will also discuss plans for the rally opposing the south Yorkshire Casuals march on 12th Dec. If you haven’t already, please visit the facebook page “I’m From Barnsley and I’m not a racist” and add your support to the more than 600 people who have already “liked” it! Established in 1983, The Derbyshire Unemployed Workers’ Centres are part of a larger network of TUC Unemployed Workers Centres. We aim to prevent or relieve poverty amongst the unemployed, underemployed, unwaged and those in receipt of or entitled to benefits and credits, as well as other disadvantaged people in Derbyshire. This year the Centre is going through the process of becoming a Charitable Incorporated Organisation. We now have 16 trustees which is a considerable reduction in the size of the previous Management Committee. On behalf of all at the DUWCs I would like to thank all the retiring members of our Management Committee for their help and support over the years. They will of course, we are sure, maintain their close links with the Centres. Barnsley junior doctors will be picketing at the main Gawber Road entrance to Barnsley Hospital on Tuesday, 1st December from 8am to 12.30. It would be great if you could get along to show your support. Please bring banners, placards and even goodies for the starving docs! Here is a video of junior doctors singing for the NHS! 5 a -side Football teams required. Welcoming Asylum Seekers and Refugees. Free Parking will be available at the ground. Ten minute walk from centre of town and all train and bus connections. Please bring your banners, family, friends and supporters! A buffet will be provided, dietary needs will be considered. Callum Stanland, a committed Unite Community activist in the Yorkshire and Humberside area, sadly lost his battle with cancer earlier this week at the age of 23. 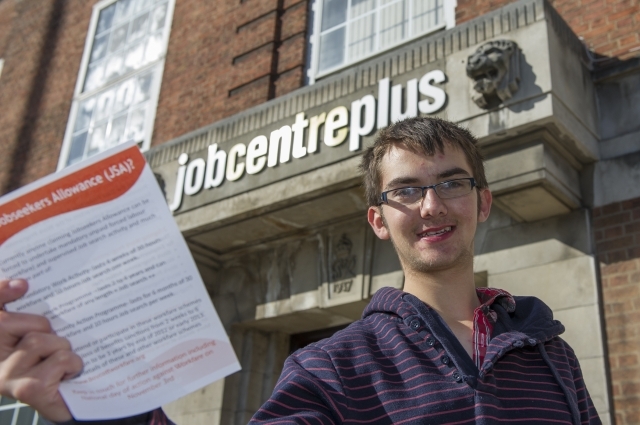 Callum, who was diagnosed just under two years ago, showed a real passion for Unite Community. He was key to many of the successes that have happened in our region. During his treatment, Callum volunteered to help run the Unite Community Centre in Farsley, as well as attending demonstrations across the country. No matter how Callum was feeling, he always put others first. Earlier this year Callum spoke at a ‘Save the NHS’ rally in Leeds alongside Ed Miliband MP and Andy Burnham MP. In recognition of his work, Callum received an award for his campaigning work. The impact that Callum had on so many people has been clear since he lost his battle, with hundreds of tributes from friends, fellow trade unionists and politicians. Karen Reay, Unite regional secretary said “Callum was passionate about our union and our members, and we are all better for knowing him. His commitment and enthusiasm was always present and lifted all those around him. It is so sad that he has died so young, before we could have witnessed his full potential as a trade unionist and political voice. I have no doubt that Callum would have had a future within our movement, within Unite. My thoughts today are for his family and his many friends in Unite the Union”. Remembering Callum’s sense of humour, Gerry Lavery from Leeds Unite Community Branch said “I first got to know Callum when he volunteered at the Unite Community Support Centre at Farsley in February 2014 and then through various other Unite Community activities. Callum was easy to work with and had a kind, gentle manner. Behind his quiet appearance was a bright and thoughtful person with a political and intellectual curiosity, which he was keen to use to develop his political ideas and activities. Importantly, he had a great sense of humour, laughing at many things, including the absurdities and contradictions of the then Coalition government. He often joked about how he might use his illness to acquire more resources for the community support centre. 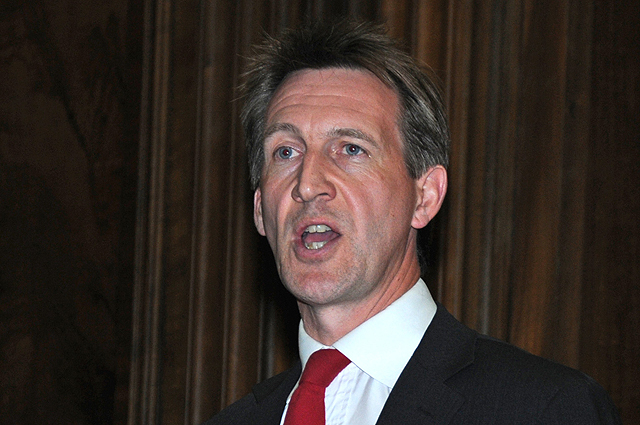 He once jokingly suggested that if he coughed in front of Karen, the Unite regional secretary – who had a real soft spot for him – and asked for a photocopier, then he was pretty sure we’d get one. 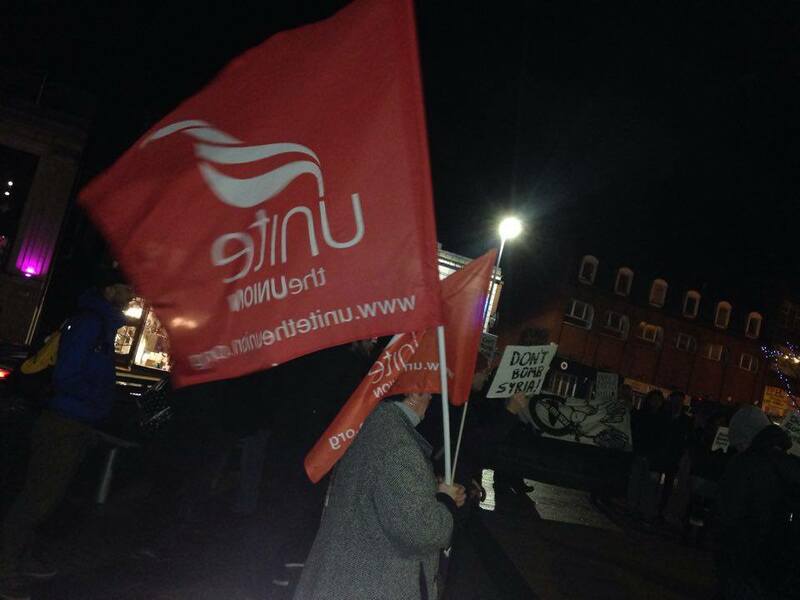 A few days after this incident we were duly offered a photocopier by the Unite office. It may be have been coincidence, but it remained a source of constant amusement. Callum was a bright and rising star and it’s hard to make sense of his death at such a young age. I console myself with the thought that he touched us all with his socialist commitment and his considerable qualities and that none of these will be easily forgotten. His passing is an immense loss to his family, friends and colleagues”.